The commander and I have just spent an amazing weekend in Brittania Bay up the West Coast with Hero, his long suffering wife Mich and pool shark Collette. The amazing parts were the weather, the warm sea, the dolphins playing in the bay and the feast of white mussels we enjoyed on Saturday night. I don’t expect to experience the combination of weather, sea and dolphins all at the same time ever again up the west coast but I will definitely cook white mussels again. White mussels live under the sand and are best collected as the tide is going out. The secret is to dig down into the sand with your foot (this is called the mussel jive) until you feel one and then dig it out with your hands. You generally find a few in the near vicinity and the sizes range from 2cm to 7cm. I found the medium ones (3-4cm) to be the nicest size inside. They are very sandy and need to be soaked in a bucket of water for a couple of hours to filter out the sand. 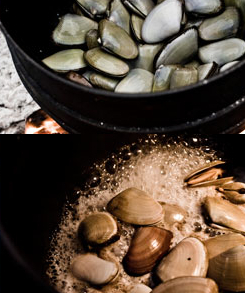 Cooking them is very simple and you can follow any recipe for black mussels. In a pot saute an onion in 75g butter for 5 minutes, added 3 cloves of chopped garlic and cooked for another 5 minutes. Add the juice of 1 lemon, 100ml white wine and the mussels. Cover with the lid and cook until the mussels steam open. Shake the pot every couple of minutes to ensure even cooking. Once the mussels have opened toss in a large handful of chopped parsley and shake well. Serve with crusty bread, extra lemon and a crisp green salad. Wow- your weekend sounds amazing! Not only the great mussel recipe but dolphins! This sounds amazing! I absolutely adore the west coast.